We are so thrilled to share with you today this home we just completed with SD Custom Homes in Lakeville, Minnesota. This classic farmhouse was on the Parade of Homes this September and it was so exciting to see how many of you toured the home and tagged us in the photos you snapped along the way! For those of you who couldn’t make it, have no fear, we’ll be sharing all of the incredible details on our blog in a series of posts. Today, we’re starting with the entire main floor, but first, let’s start with the curb appeal. The exterior and layout of the home was a vision created by Katie at SD Custom Homes. She put her dream layout on paper, and we took her inspiration and made the design happen! We’ve been dying to create a classic, clean farmhouse with SD and we knew that it would be a perfect fit for the area this home is in. 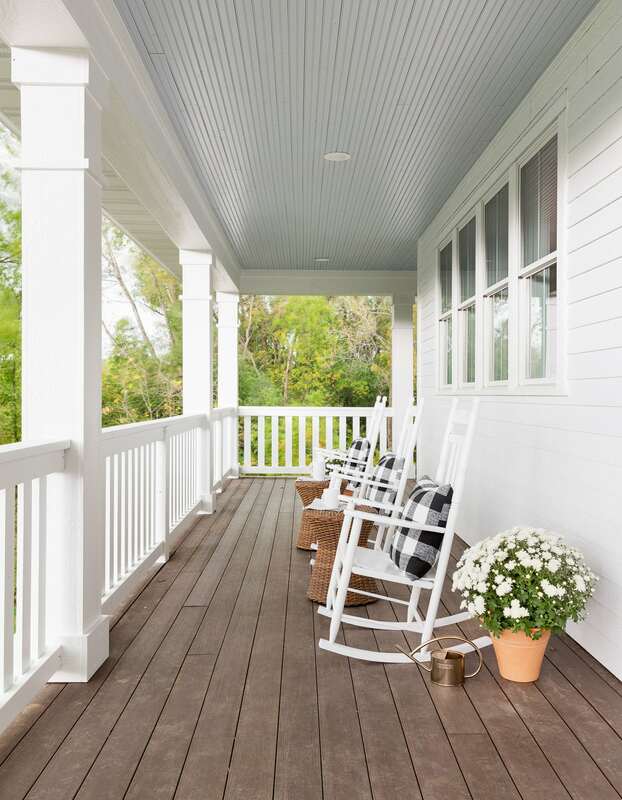 One of our favorite details of the exterior is the massive wrap-around front porch. Because, honestly, what’s a classic farmhouse without one? Add a few rocking chairs and the future homeowners will have a space where they can relax and enjoy their front yard! 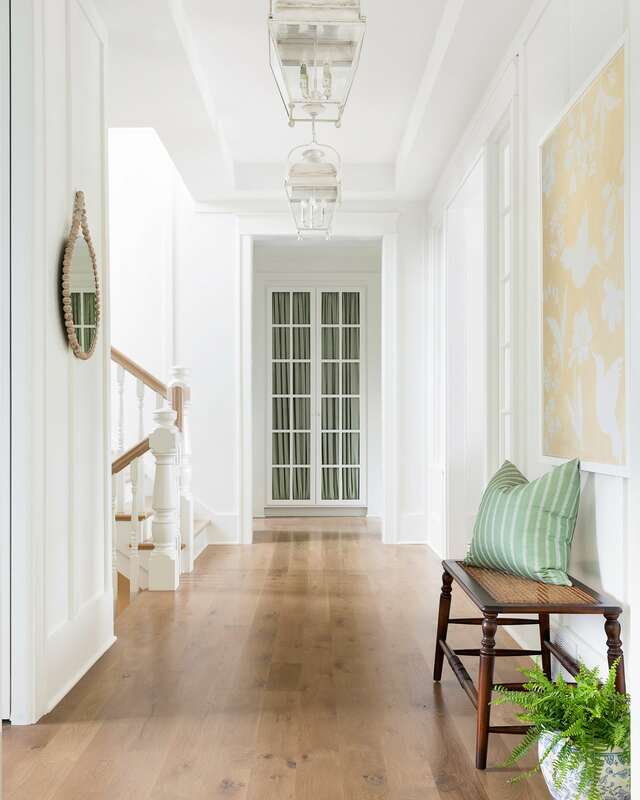 Before you even walk through the front door, you are immediately greeted by this beautiful white oak door. We chose to go with a natural wood because we knew it would pop against the white siding and really make it a focal point of the entryway. 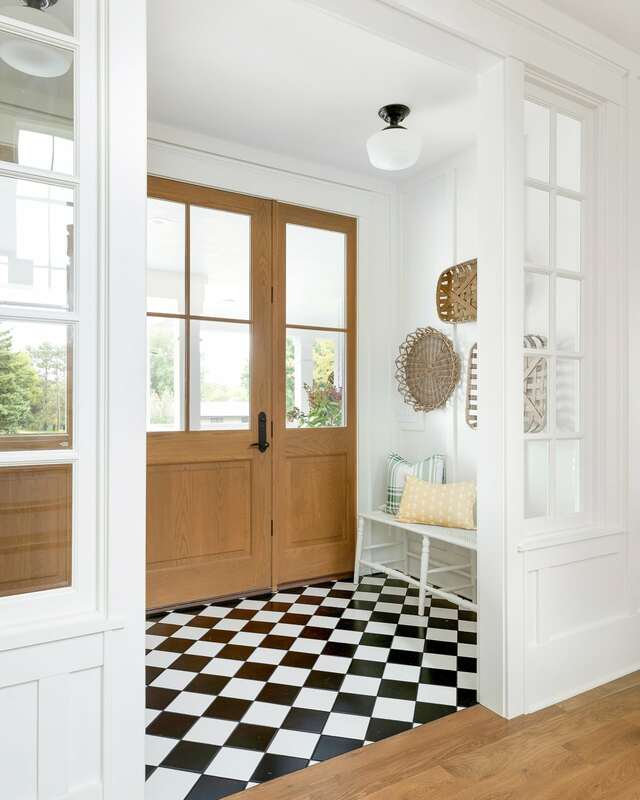 In the foyer vestibule, we tiled the floors with a matte, black and white diamond pattern which is not only beautiful but functional for our messy winters and heavy boots that tend to drag in sleet and snow. We paired two benches (launching on Brooke & Lou in a few weeks!) on either side of the door so that guests have a spot to set their purses, jackets, or a place to sit to put on their shoes. One of the most charming rooms in the house! And not just because of the Brooke & Lou wallpaper, although, it doesn’t hurt! To tie in the wood of the front door, you’ll see that we placed more beautiful natural wood throughout the home. This custom vanity that Regalwood crafted for us is one of the wood accents, and is such a stunner! The scallop edge is such a beautiful detail that truly makes the piece feel one-of-a-kind and the room that much more special. Ah, the kitchen! To say that we worked with pretty much a dream team for this room would be an understatement. 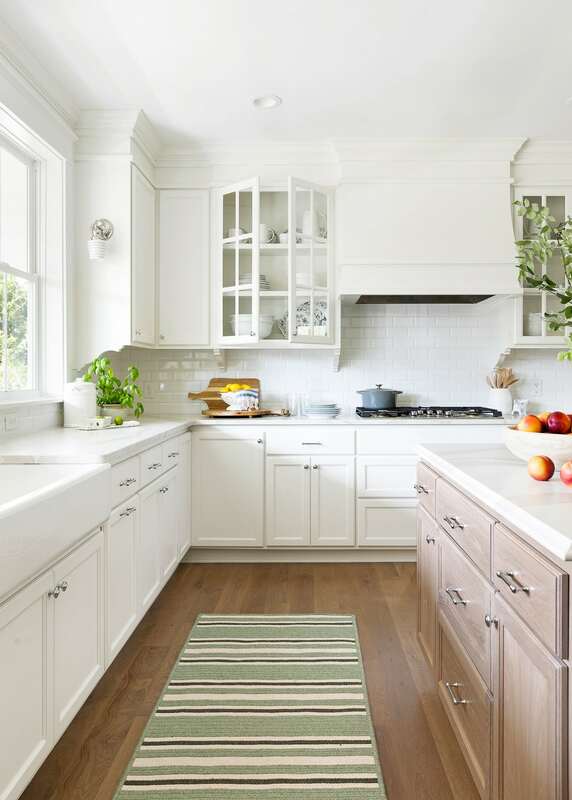 Regalwood built the beautiful cabinetry for the Cambria countertops to rest on and, to top it all off, GE Monogram blew our minds and gifted us all of these sleek, sophisticated, cutting edge appliances. Not sure if the photos do it justice, but the island in this kitchen is seriously massive. So often kitchen islands are faced horizontally in the room, but we decided to switch it up and have it be a long, vertical eye catcher. We love how much space it provides to not only prep and cook meals but also for family and friends to gather. We designed the island legs with beautiful soft, curved details and added our Rose Counter Stool in our Life-Friendly™, wipeable fabric – perfect for a kitchen! Adjacent to the kitchen is the pantry! 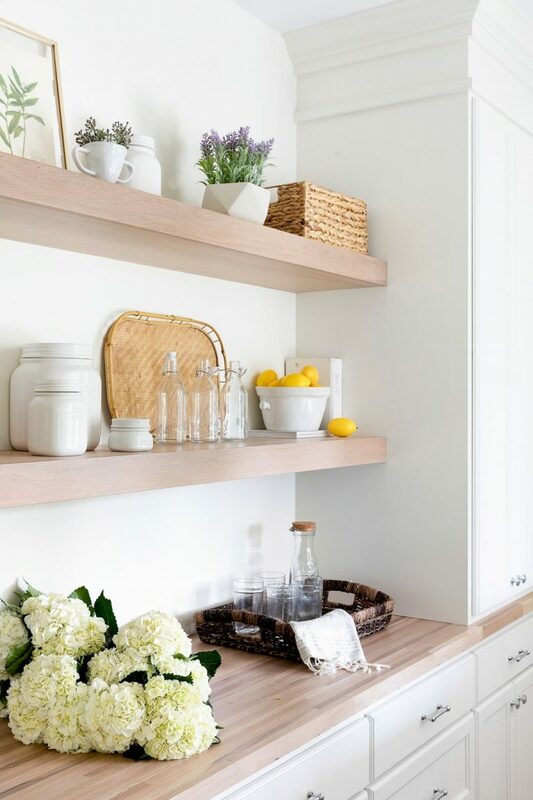 A pop of natural wood in the open shelves warmed up this space and made this room so inviting. We love the natural light this room gets so we decided to go with a partially glass door so that it carried through to the kitchen. While we love that the kitchen and dining area are open concept, we wanted to create something that was special for the dining area without making it formal. We decided to push the space out a bit and added two sliding doors (that lead either to the backyard or the wrap-around front porch) as well as place a giant window that looks out to their beautifully wooded area outside. 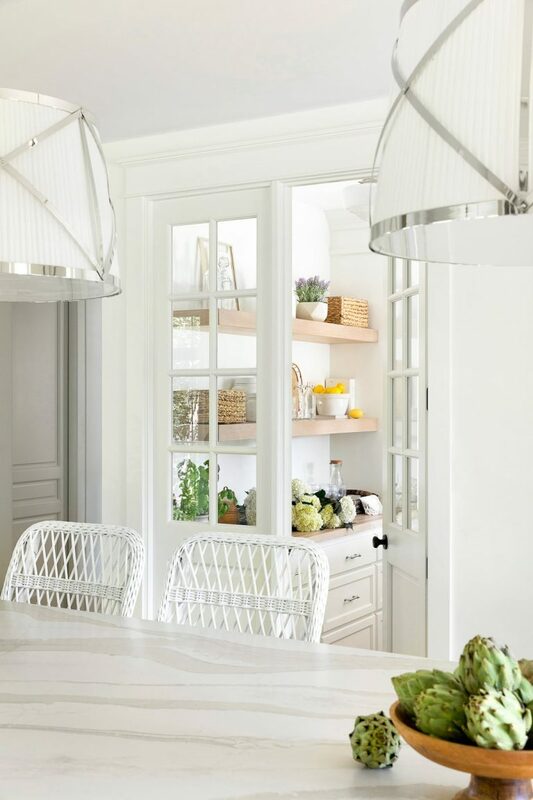 To finish it off, a formal light fixture paired with a casual built-in bench gave the perfect balance to the space. We knew we wanted to give subtle farmhouse nods in the interiors of this home without it going too rustic. The exposed wood beams that lead into the living room did just that and we love how it brings another level of coziness and character to the room. 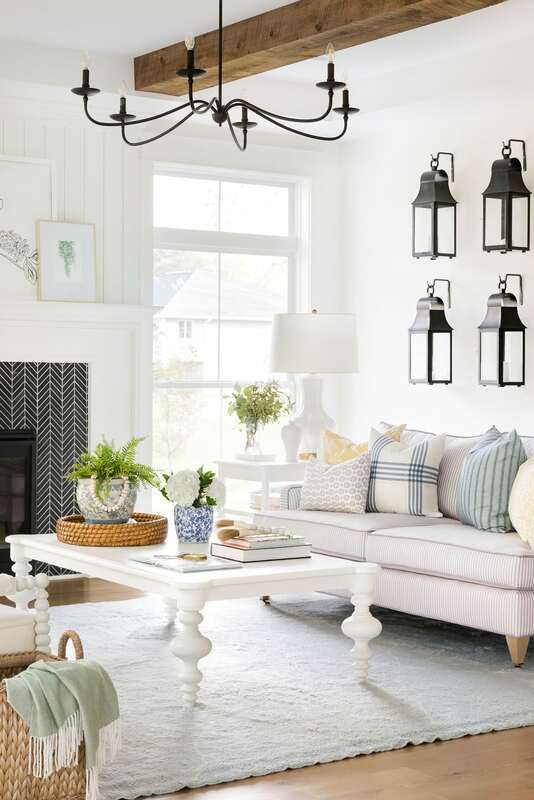 While most of the decor is soft and pastel, the pops of contrast from the fireplace, light fixture, and lanterns really make this area the showstopper that it is. If you’ve been following us for a while, you know that we previously did a lantern wall in our Scottsdale project. After brainstorming with SD as to what we could do for a fun feature in this space, we knew that the lantern installation would fit perfectly in this home and decided to go for it! We love how it tied in with the black tile of the fireplace and it really creates such a warm, inviting environment at night when the candles are all lit up. The office is right off the foyer. 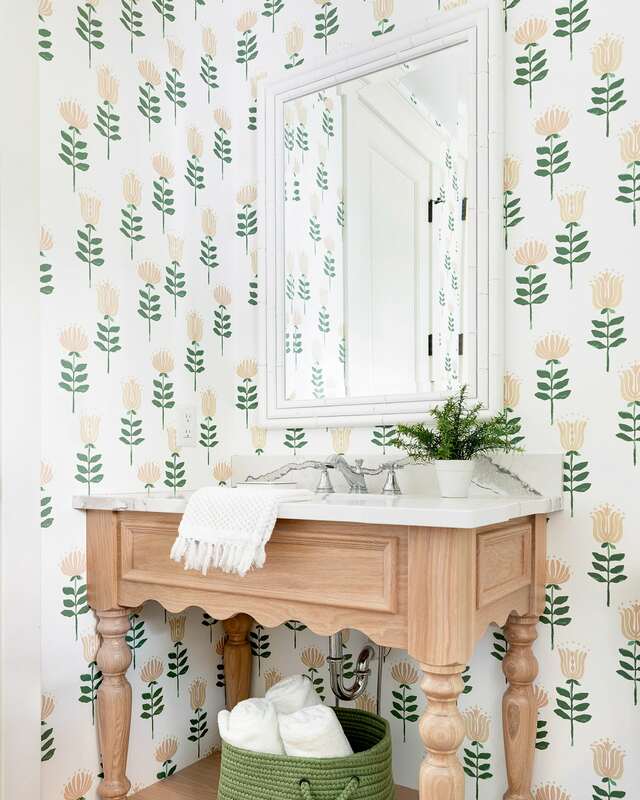 We built this custom desk that fits two people comfortably, and for a bit of personality, we installed our Brooke & Lou wallpaper (which works perfectly in this space and makes the ceilings look so high!) and a lantern. Because it’s a smaller room, we placed a pocket door which won’t invade the space but can provide privacy and quietness if needed. 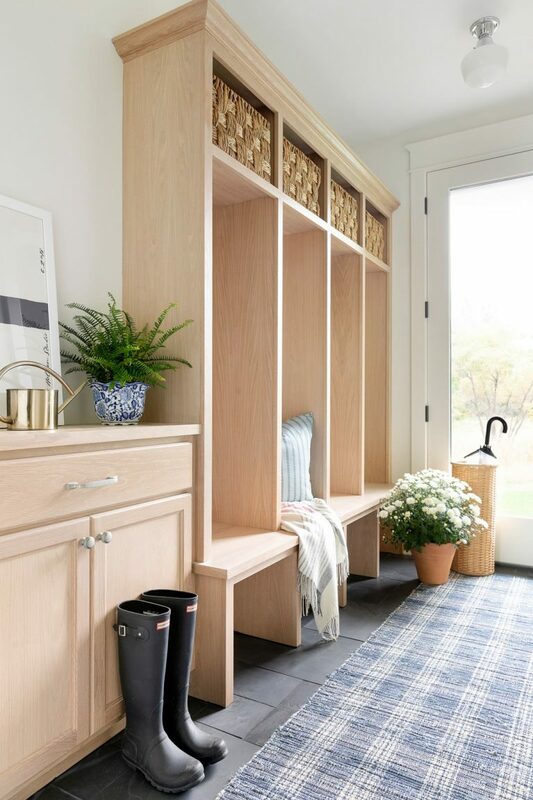 Last, but certainly not least, on the main floor is the mudroom. 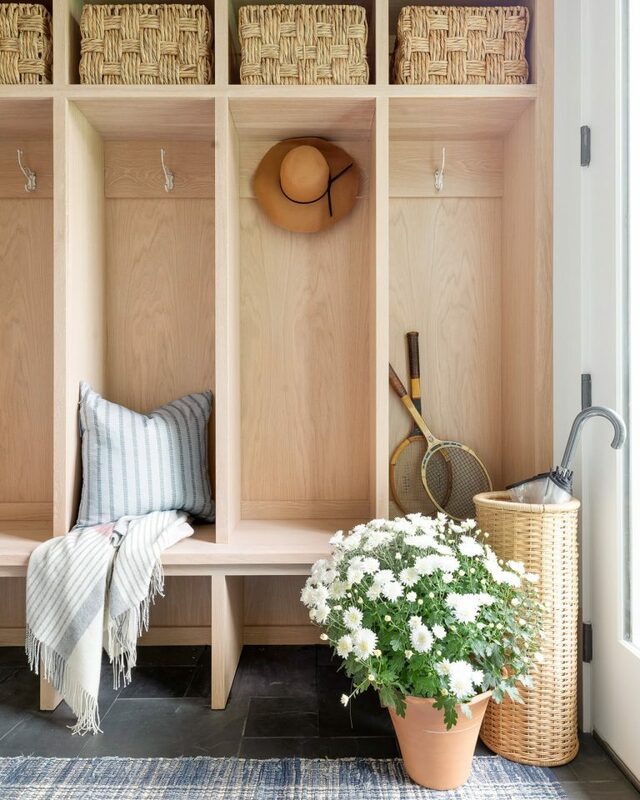 We built this home with a large family in mind so we knew that a mudroom right off the garage was necessary. We love this one not only for it’s beauty but because of its functionality too! You can never have too many hooks, baskets, and cubbies, right? That’s Part I of our Lakeville Farmhouse project! What do you think of this beautiful home? Up next will be the upper level which includes lots of bedrooms, bathrooms, the laundry room, and the most amazing bonus room that you won’t want to miss! Additional Credits: Photography by Spacecrafting Photography. This kitchen was in collaboration with GE Monogram, a brand we love and adore. All opinions are our own. This is beautiful! Every detail is perfect! I especially love the blue vases on the dining table. Do you sell them on your site? Beautiful home! Would you share what wood floors you used? I really love the mix of painted and then warmer wood tones. Thank you! This is a wide plank white oak floor with natural stain. Everything is absolutely beautiful! Wishing I lived in Minnesota 👏🏻. Beautiful kitchen! I love the look. May I ask whether the countertops are Cambria Brittanica or Cambria Brittanica Warm? Thank you so much! They are Cambria Brittanica Warm!